If you want to travel to Phi Phi by helicopter this is unavailable at the moment (July 2012) as there are no commercial helipads on the island. However if you want a helicopter tour of Phi Phi this can be done from the Phuket Heliport based at the Phuket International Airport. 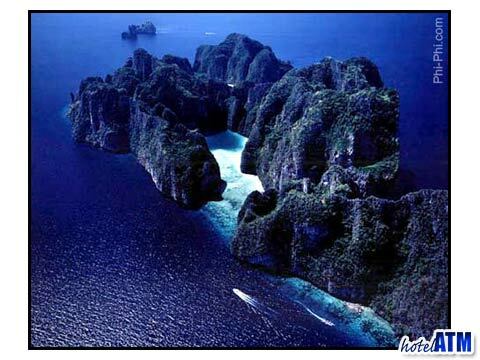 As you approach Phi Phi Island by helicopter you become aware of the true beauty of the archipelago. Tropical jungle clings to the vertical cliffs of Phi Phi Don and Phi Phi Ley. The deep blue of the Andaman sea gives way to the aquamarine of the reefs and shallow waters which then contrasts with the brilliant sand of the golden beaches. There is so little of Phi Phi but what there is is dramatic. The main village at Tonsai Bay is the centre of accommodation, a place to organise a dive trip or a tour by boat or maybe have a seafood feast on a beachfront restaurant. This village is dwarfed by the mountains on one side and the cliffs on the other and becomes just a small blemish on what is a pristine setting. There are no cars on Phi Phi so the rest of the island appears to be a vibrant green of coconut tree, cashew nut tree and jungle paradise. The main Helicopter to Phi Phi run brings in the government dignitaries to survey the island. This is done on a regular basis 3 or 4 times a year and government officials come in the form of the occasional Royal visit, Governor of Krabi Province, or sometimes the Bangkok Police. 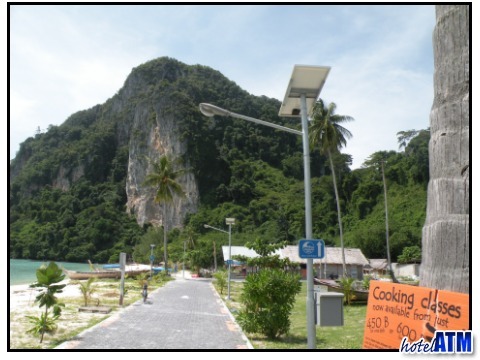 The main Phi Phi helipad is at the Phi Phi Island Cabana Hotel. The Helicopter tour of Phi Phi starts in the far north of Phuket Island at the Heliport at the Phuket International Airport. The tour heads south over the mountainous highlands of Phuket. Skimming over the Laguna Beach, Kamala, Patong beach you take in the contrast of scenery with tall (600m) Patong Highlands juxtaposition with the long and lazy beaches of the islands west coast. Continuing down to the southernmost tip of Phuket and past the Big Buddha temple at the top of th Kata Highlands you come to the magical Promthep cape, a huge draw for those wishing to see an almost perfect sun set. As the helicopter heads east the scenery changes away from the mountain and beach to 'beach and island'. Koh Racha, Koh Lon, Coral Island all can be viewed on the way out to Phi Phi with their beautiful sandy beaches. In fact, as you head over to Phi Phi you start to see the magic of the limestone cliffs in the Koh Roc Mai and Phi Phi Ley. However before you go there you swoop north to the famous coral fringed Chicken Island to see a perfectly formed tropical atoll. is a striking moment as you realise the perfect shapes of the bays and inlets that make up Thailand's most famous island. Heading north you follow part of the 20km of coral reef that surrounds the Phi Phi Islands and head out towards Krabi Province. Arriving at the Phrang Nga stony wall of cliff you become intrigued at how much similar scenery to Phi Phi exists. Railay East and West Beaches have a similar shape to the Tonsai and Loh Dalum Beach on Phi Phi Don. Skirting past Ao Nang you see the Krabi hinterland and the towering Khao Blencha mountain range that reaches 1,700m. From here you head North West and pass over the Koh Yai Islands, but not before visiting the Koh Hong inlet. The last primary location on the route is the famous Koh Tapu or James Bond Island, the iconic beach where they made the movie 'The Man with the Golden Gun'. The helicopters were used a lot during the 2004 Phi Phi Tsunami which claimed over 1,500 lives. What with government troops, police and politicians and the arrival of the press, Phi Phi Island Cabana Hotel helipad had the atmosphere of a war zone as each different VIP vied for landing access and the sound of low flying helicopter was heard all day for days.